She was returning to Holland from her maiden voyage to New York on October 15, 1872. As she prepared to enter the Voorne Canal for the return trip to the harbor of Rotterdam, carpenters stood ready with hatchets. It seemed that the builders had made the ship slightly larger than the architects had specified, and there was some doubt that the new ship would fit in the locks. Yet fit she did, with only the space of a bumper between her bow and the lock gate. Soon, the Rotterdam I had returned home to the port whose name she proudly carried. Since the founding of Holland America, the line's flagship has been named Rotterdam, in honor of the great Dutch seaport that was the company's original home. When the new Rotterdam VI sets sail in 1997, she will carry with her the tradition of a grand heritage. By 1872, the days of the great sailing vessels were coming to an end. A group of visionary men in Rotterdam surmised that the time had come for a Dutch steamship service to America. On June 6, 1872, Plate, Reuchlin & Company launched the ss Rotterdam, a single propeller, iron-hulled ship of 1,694 gross tons, designed specifically for carrying passengers and cargo to America. Sailing at a brisk (for that time) pace of up to 10 knots, she cut the trans-Atlantic crossing time from six weeks to 15 days. She could carry some 1,300 tons of cargo and had space for eight first class passengers and 388 second class passengers. Since steam was not yet considered completely reliable, the ship was also equipped with sails and masts both before and after the steam engine funnel. In 1873, the company was reorganized. 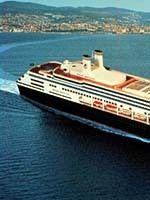 The new De Nederlandsch Amerikaansche Stoomvaart Maatschappij (NASM) later became known as Holland America Line. The company established monthly trans-Atlantic service between the Netherlands and New York, and gradually added more vessels. The new steamship company was on its way and in 1998, the line will celebrate its 125th anniversary. Although early Holland America ships carried both cargo and passengers, the turn-of-the-century tidal wave of European emigration fueled much of the line's initial growth. Between 1880 and 1920, some 25 million people left Europe for North America. "It was a huge migration," says Cees Huurman, curator of the Prins Hendrik Maritime Museum in Rotterdam. "People came from all over Europe in search of a better life in the New World. And many departed for America from Rotterdam. New and better ships were a necessity to keep up with the demand." After carrying passengers across the Atlantic for a decade, the Rotterdam I was wrecked at Schouwen in 1883. In 1886, the company purchased the four-master British Empire, and refurbished and refitted her as the Rotterdam II. At 3,329 gross tons, Rotterdam II was now the largest ship in the fleet and equipped with twin screws along with an "artificially cooled chamber" to carry meat and other perishable goods. It did not, however, have sails. "There was a lot of controversy when the sails were finally left off," says Huurman. "but the Rotterdam was always a leader in design." In 1886, the Rotterdam II undertook what many believe was Holland America Line's first cruise, from Rotterdam to Copenhagen. During the voyage she was the first passenger liner to pass through the Kiel Canal. By 1897, the company reported that 90,000 cabin class passengers and nearly 400,000 third class passengers had been carried across the ocean, along with 5 million tons of cargo. 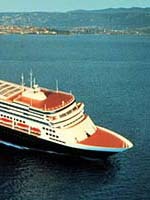 Holland America ordered the company's largest vessel up to that time from Harland & Wolff in Belfast. Christened the Rotterdam III, the 8,186 gross ton ship replaced Rotterdam II, which was re-named Edam III. Now, passengers took priority over freight, and Rotterdam III carried 200 first class passengers, 250 in second class and 2,000 third class passengers. She was so successful that newer and larger ships were ordered. The Rotterdam III was sold in 1906. In 1908, Rotterdam IV, built by Harland & Wolff in Belfast, set sail. At 24,149 gross tons, she was the pride of the fleet and carried 520 passengers in first class, 555 in second and 2,500 in third. Maintaining Holland America's tradition of innovation in design, she was the first ship on the Atlantic to have a glassed-in promenade deck. The first class vestibule, with a grand, double-bannistered staircase, might be seen as a precursor of today's atriums. Rotterdam IV was the largest Dutch ship for nearly two decades and remained the pride of the fleet until laid up in 1939, after sailing a distance nearly equaling 72 times around the world. 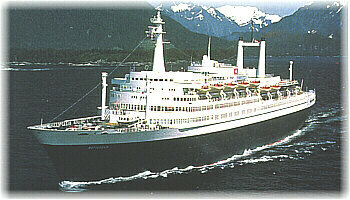 On September 13, 1958, Holland America launched the Rotterdam V, a 38,645-gross-ton trans-Atlantic liner designed to cruise the world. "She caused a sensation, since she didn't have traditional funnels but rather two diesel exhaust stacks," notes Huurman, who sailed on the ship as a young engineer. "This caused as much of a controversy as the earlier Rotterdam did when it was launched without sails in the 19th century." Capable of a speed of 26 knots, the Rotterdam V has made a world cruise nearly every year since her launch. With the classic Rotterdam V scheduled to be retired in September of 1997, her successor, Rotterdam VI, is already under construction. The new flagship of the fleet also will be designed to cruise the world and continue the seafaring legacy of Holland America Line.